12 "new" shades to help you live out your colour fantasy... and not all are smooth sailing. Greetings fellow polish nerdies! 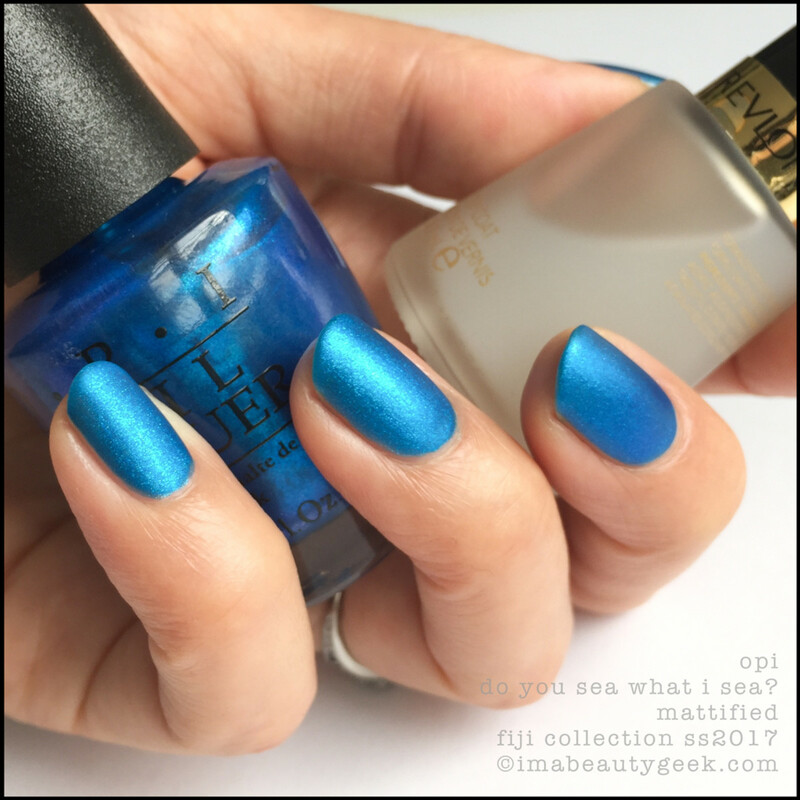 It’s time for your OPI Fiji Collection Swatches & Review! Yay! Before I begin, I should mention that nothing here came to me via OPI PR – no images, no polishes, no official wordage. What I do have, is the collection of 12 tropical-esque Fiji shades in regular lacquer that I bought from SparkleCanada.com. Do I know when the official release date is? Nope. All I know is that as of now (January 27, 2017), they’re available in lots of places, in-store and online. So, shall we have a look and decide if there’s stuff to add to your “Oh-Crap-I-Broke-Another-No-Buy” list? After you&apos;re done here, pop over to see Lisa over at CosmeticSanctuary.com. 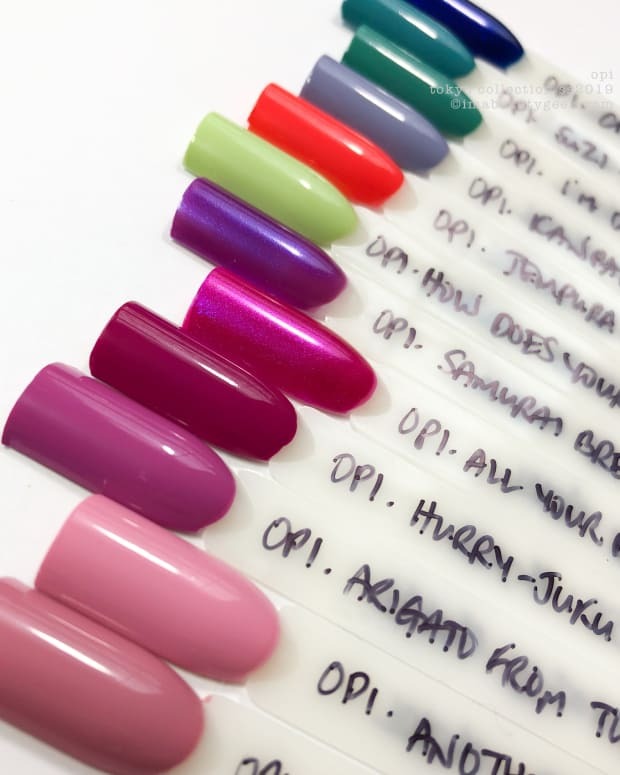 She got (and reviewed) all 12 OPI Fiji shades in Infinite Shine. Lovely Lisa and I pretty much agree on both formulas and application so I trust her opinions (and her photos). She had a lot less trouble with some of these than I did. Might make it worth it to buy the ones with the shiny silver caps, huh? 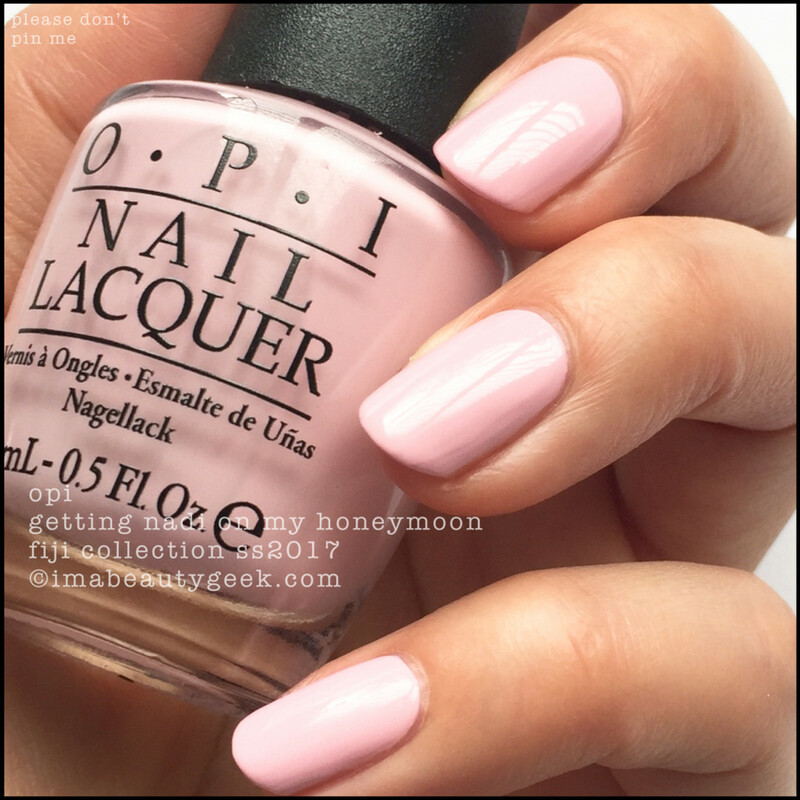 OPI Getting Nadi On My Honeymoon (above). See those sidewalls? Those are streaks that I just could not get to level. And that’s 4 coats. Grrr. Maybe I’m out of practice or maybe I just can’t work this kind of whitened cream formula but I wanted to kill this polish until it was dead. 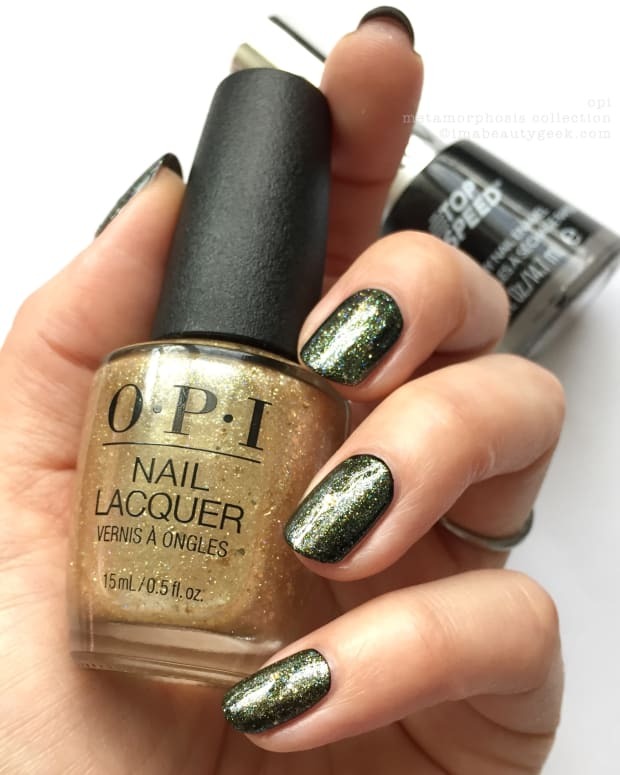 OPI Polly Want A Lacquer? – OPI Fiji SS2017 (above). How’s that for a beautiful shade of lavender? It’s really Spring and it’s so very lovely! Also, it’s 4 coats and not fun to apply. See those tiny bubbles at the top of the bottle? That’s your first clue as to how thin the formula was. If we’re keeping track, that’s 2 crap formulas in a row. And I’m keeping track. OPI Two-Timing the Zones – OPI Fiji SS2017 (above). Oh happiness! This pink pleases me. I’m going to pretend I’ve never seen one like it before. It’s vibrant, it goes on in 2 fantastically easy coats, and all the blue that’s stuffed into it makes it wonderfully warm. If you think you can’t wear pink, I say try this one. It’s going to look great on you! OPI Living on the Bula-Vard! 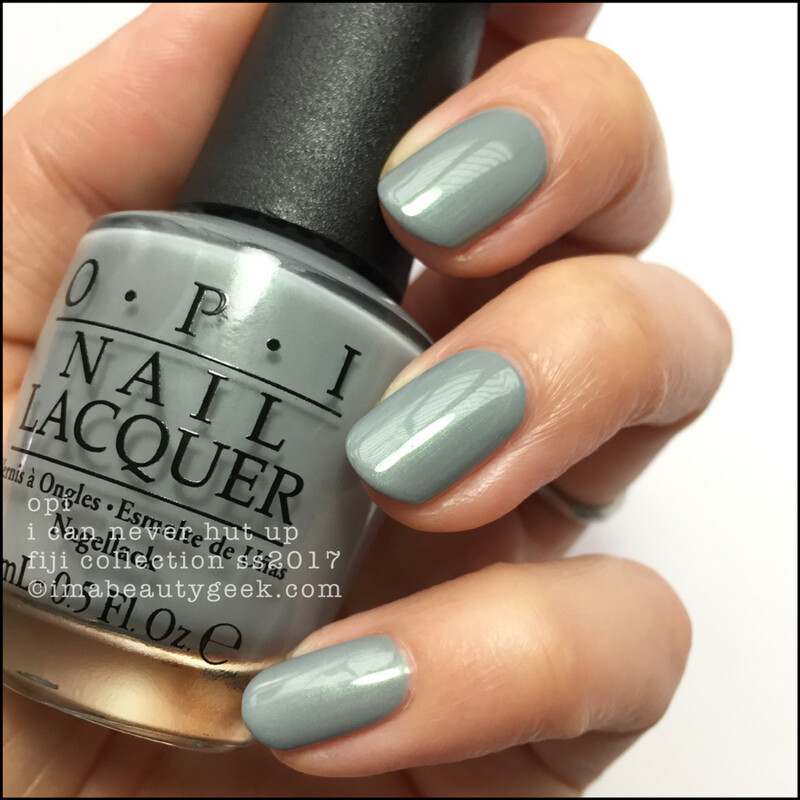 – OPI Fiji SS2017 (above). Holy dynamic coral, Batman! It’s fairly brimming with juicyness, right? That’s 2 coats and the formula is a tiny bit thin so you’ll need to keep good control of your polish blob and be careful not to overload your brush. 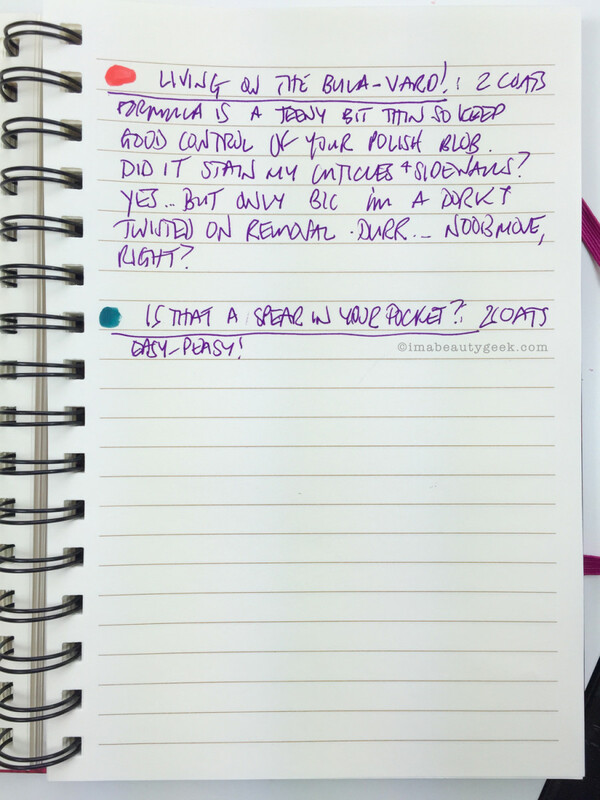 Oh – did it stain my cuticles and sidewalls? Yep, but only because I pulled a noob move and twisted the pad on removal. Durr... whattta dork. 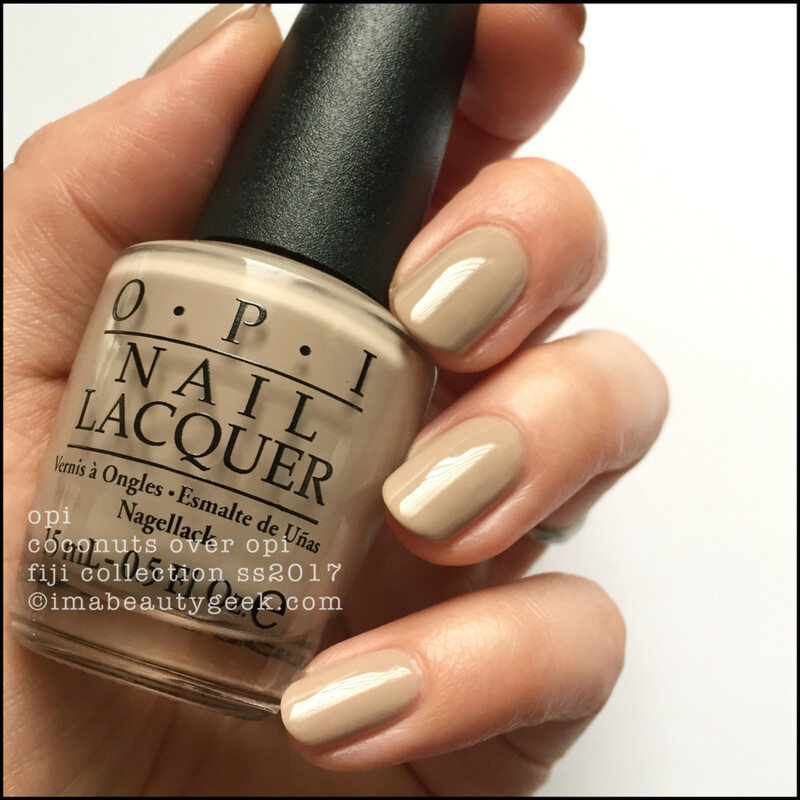 OPI No Tan Lines – OPI Fiji SS2017 (above). I tell ya what, if you don’t have the OCD, you can do this in 2 coats. This here is 3 because, well… yeah. Also, she dries down darker than what you see in the bottle – by a fair amount. 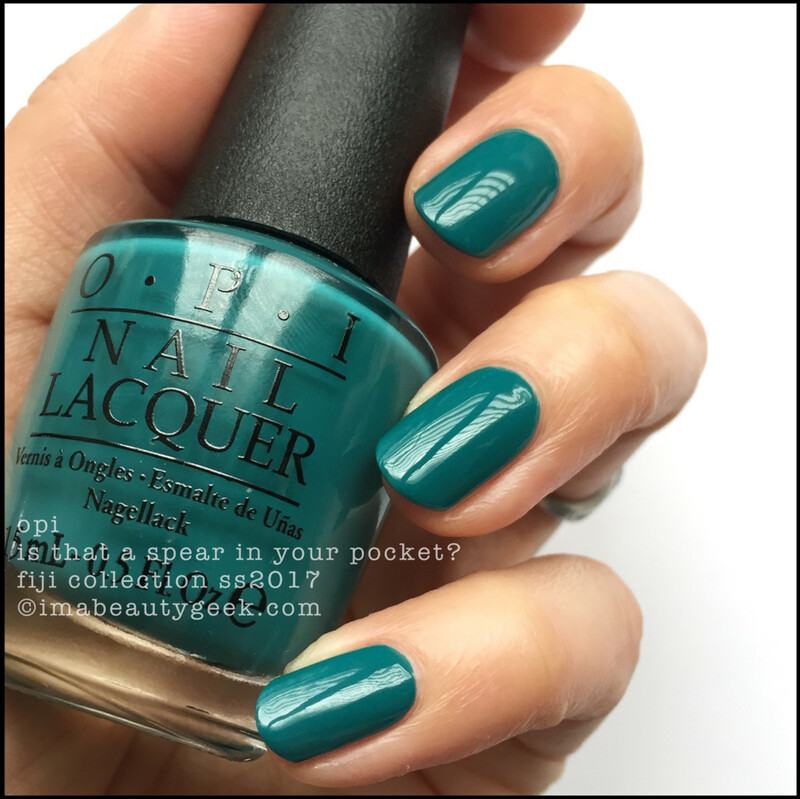 OPI Exotic Birds Don’t Tweet – OPI Fiji SS2017 (above). It’s yellow. But it’s nice and sunny. It’s not too buttery, and it’s not too egg-yolky. You expect to need at least 3 coats for a yellow, and this one doesn’t disappoint. 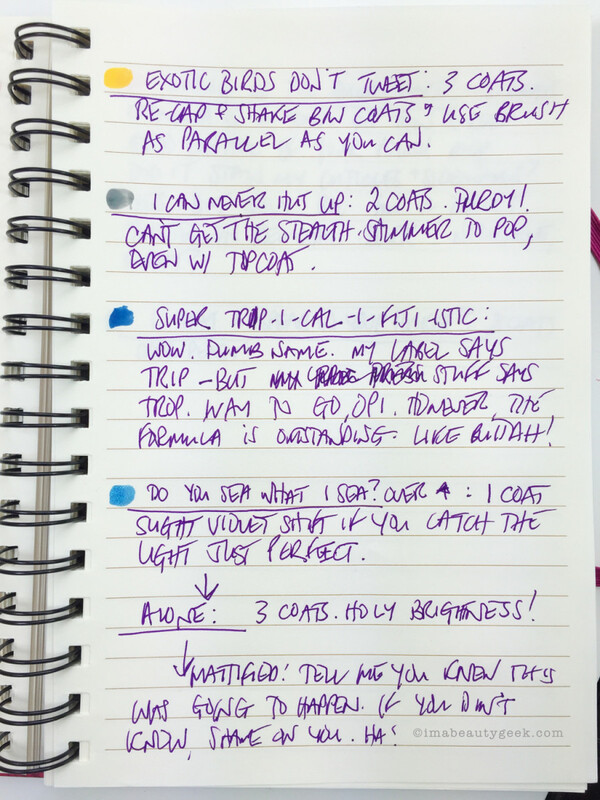 It’s 3 coats. If you keep your brush as parallel to the nail as you can, and re-cap and shake the jeebz out of it between coats, you’ll get a result as excellent as I did with minimal effort – for a yellow. OPI Is That A Spear In Your Pocket? – OPI Fiji 2017 (above). Sometimes I lurk in forums (and other assorted places) where people talk smack about bloggers and Instagrammers. They say they’re too negative about some brands, or that they love all the things all the time, and can&apos;t be trusted. I like to think I’m not overly negative or overly gushy unless the occasion (aka polish) demands it. This beautiful green? I gush. 2 easy coats to a shade that just makes me feel good when I look at it. It went on all dreamy-like, dried down insanely close to the bottle shade and is what I expect from a brand that’s as well-established as OPI. It is good. Great, even. 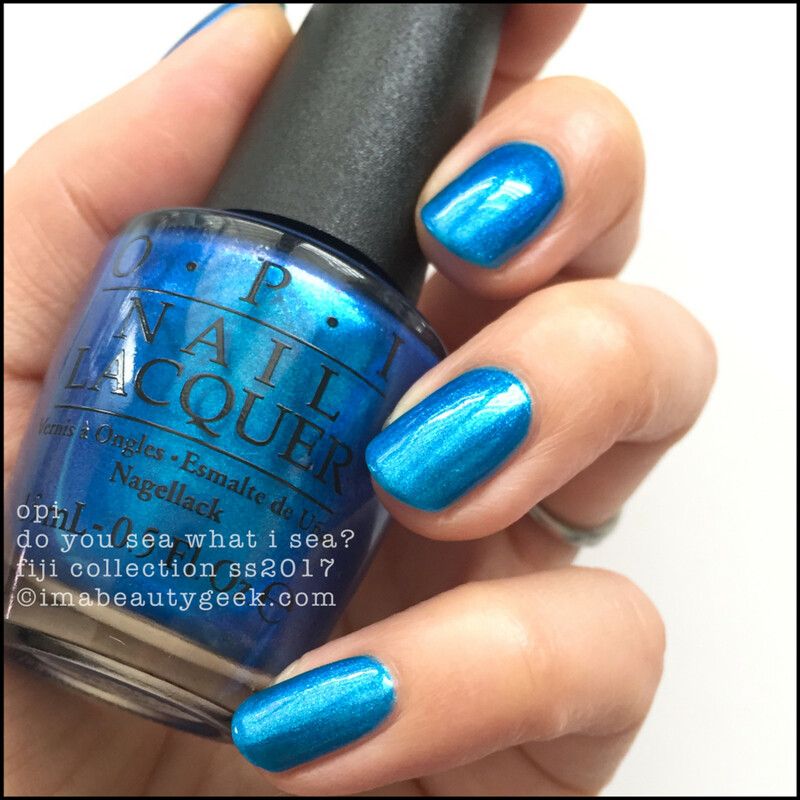 OPI Suzi Without a Paddle – OPI Fiji SS2017 (above). I don’t have a lot to say about this shade except it’s 3 don’t-use-no-pressure coats. You might also need to put a little more on your brush than you think. Right now, you’re looking at this and seeing perfection. I’m looking at it and seeing tiny streaks down the sidewalls. I think top coat might have taken care of those though – in fact, I’m pretty sure it would have. So, if you top coat and use base coat, and 3 coats of colour, that’s only 5 coats for a full manicure! Hahahaha! No. OPI Super Trop-i-cal-i-fiji-istic (above). It’s actually THIS blue. My camera did not want to shoot this colour-correct. At all. I must have taken over a bajillion shots to get this perfect one. Trust me when I tell you the blue looks exactly like this. Do I need to tell you that when you’re lookin’ at my stuff you need your device set on medium brightness to get the most colour-accurate representation of colour? 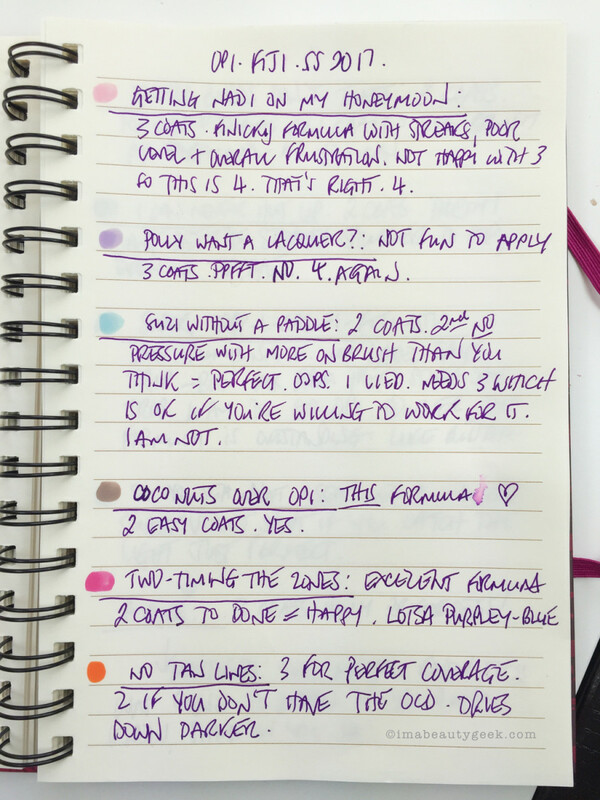 Yeah, medium brightness – that’s the best for all your Beautygeeks viewing! OPI Do You Sea What I Sea? 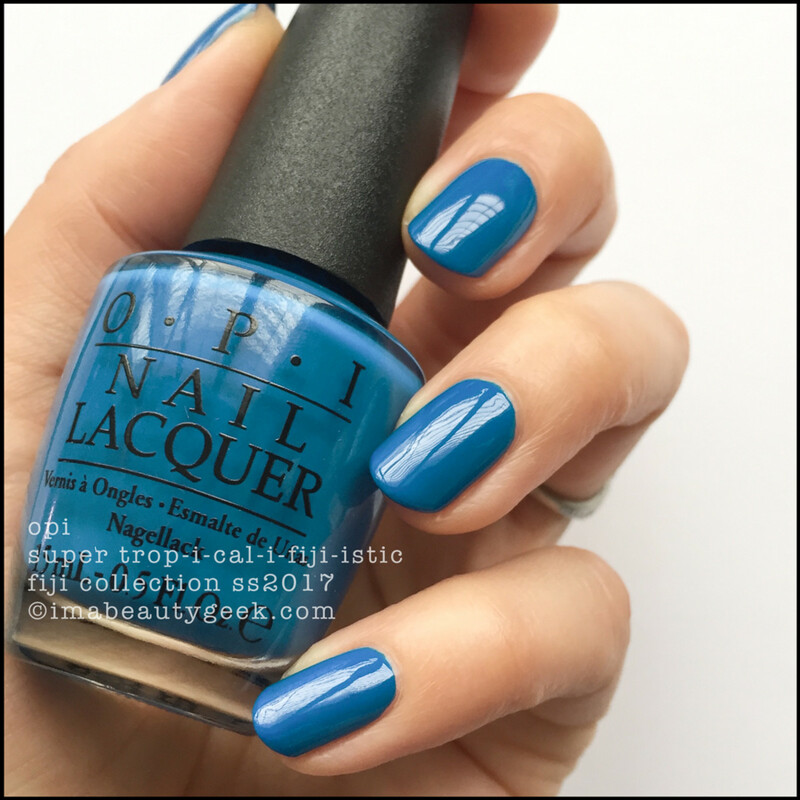 over Super Tropicalifijiistic – OPI Fiji SS2017 (above). Gaaah!! #GrabbyHands. Yes, even though it’s not an unusual combination, I somehow managed to achieve a freakish level of sophistication using these shades together. I don’t know how this resulting blue seems to make my fingers look like money but it just does. So clean, so vibrant, so shimmery, so freakin’ amazeballz. That’s 1 coat of Do You Sea over 2 coats of Super Trop-i-hyphen-garbage-shade-name-that’s-the-absolute-worst-thing-to-type-ever and there’s a very subtle violet shift there if you can catch the light just right. 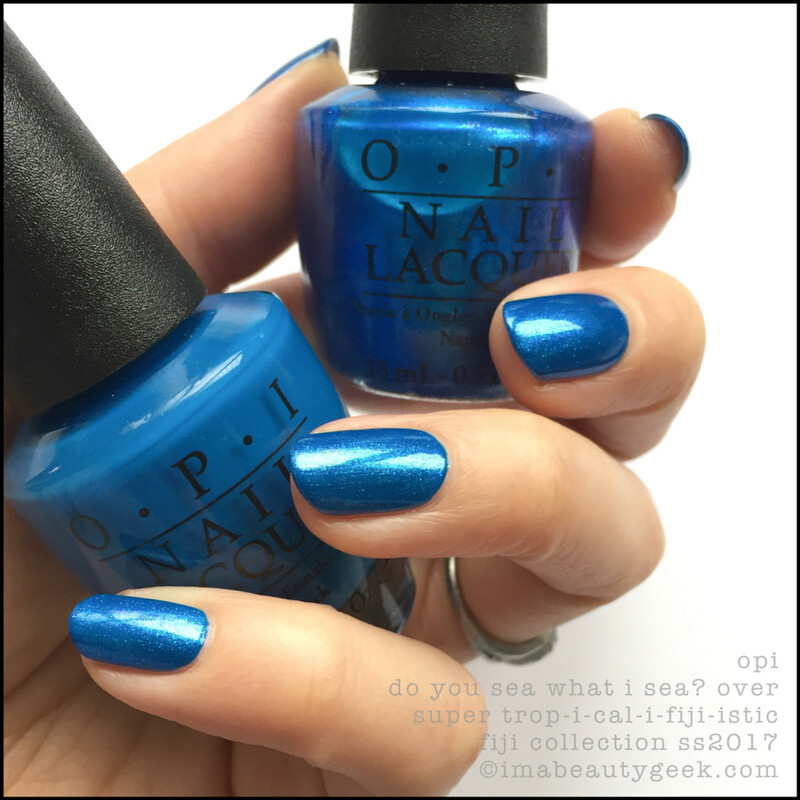 OPI Do You Sea What I Sea? – OPI Fiji SS2017 (above). Can you wear Do You See What I Sea by itself? Absolutely! That’s 3 coats to cover all visible nail lines and they go on thin and dry fast. This thing is insanely bright. Like, blinding. And stunning. From looking at the bottle, I had no idea there&apos;d be this much happy in there. Trust me. It’s remarkable. 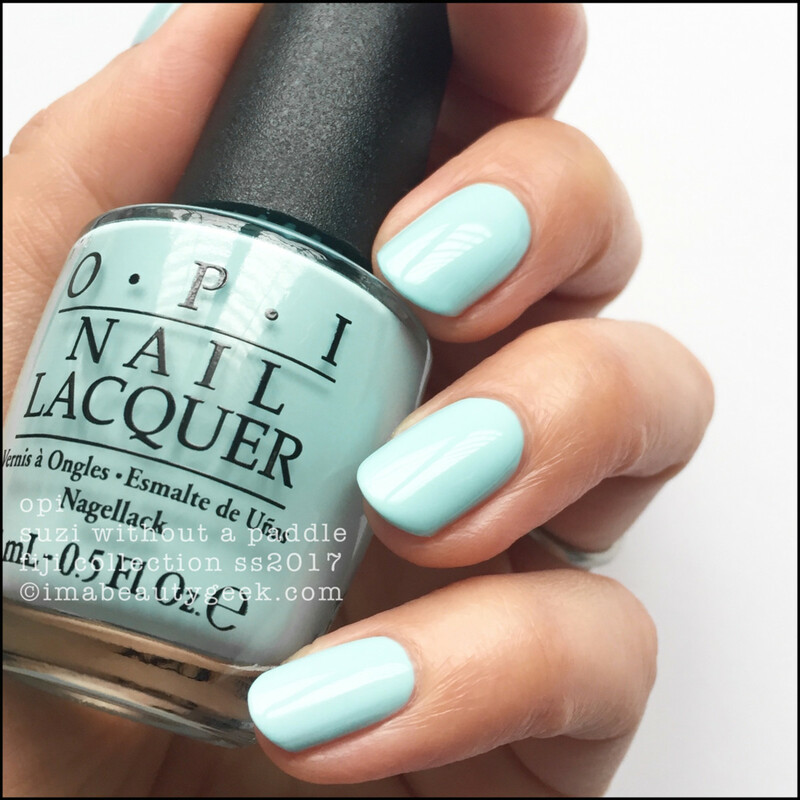 OPI Do You Sea What I Sea? – mattified (above). Yeah, you knew that was gonna happen, right? But check it out! It’s mattified but still crazy bright! Come on, you’re kind of gobsmacked too, right? 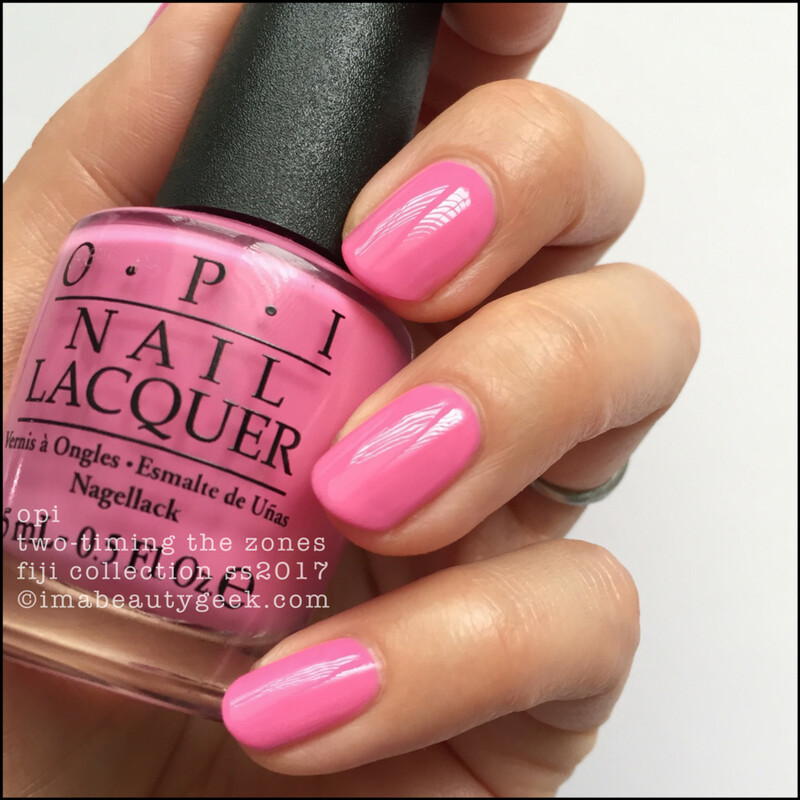 OPI Coconuts over OPI – OPI Fiji SS2017 (above). It’s not often I use words like flawless, but this here toasted taupe is flawless. The application was 2 easy coats, the level is swell, the shine is excellent, and it barely pops the lobsters on me. There’s really not a single thing more I could have asked for from this bottle. It made me smile in a way that neutrals rarely ever do. 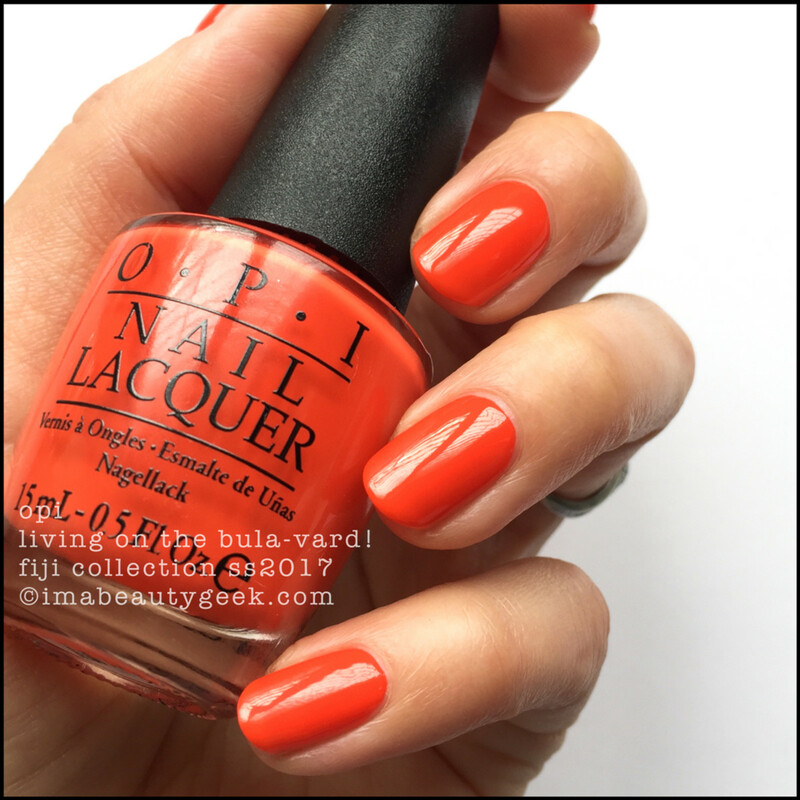 OPI I Can Never Hut Up – OPI Fiji SS2017 (above). Huh. Now there’s an interesting shade for a Fiji collection, huh? What’s the deal? Well it’s to make your digits “mesmerizing in this iridescent, edge-of-dawn grey”. Okay. I totally want to be mesmerizing, but the turquoise shimmer in here kinda falls a bit flat. In natural light, I just can’t get it to pop. OPI I Can Never Hut Up – OPI Fiji SS2017 (above). If I punch it in the face with my desk lamp (no, it&apos;s not an Ottlite), I get a bit of the greeny shimmer right along the bulb blast. I think mostly, that stealth shimmer stuff serves to lighten this beautiful silvery-grey while adding some depth. Do I like it even though I can&apos;t get it to pop? Yes. Yes I really kinda do. And that’s it. That’s all! Pretty collection, right? 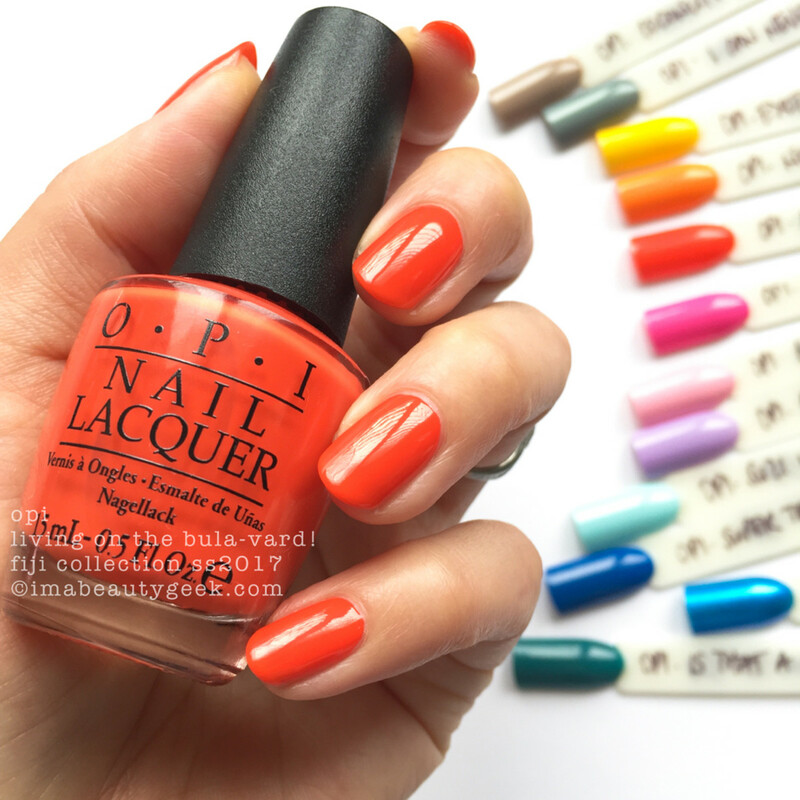 So now, how about we chat about this brilliantly tropical collection that is OPI Fiji Spring Summer 2017? Does anything grab you, or did you fall asleep halfway through? Crap, if you fell asleep, you&apos;re about to miss all the good stuffs! Yes, that&apos;s really the process. Please don&apos;t ask me to translate that chicken scratch - I can barely read it myself and I just wrote it yesterday. I sure do wish I could write as neatly as I paint. Thankfully, I can keyboard so that&apos;s sumthin&apos;, right? 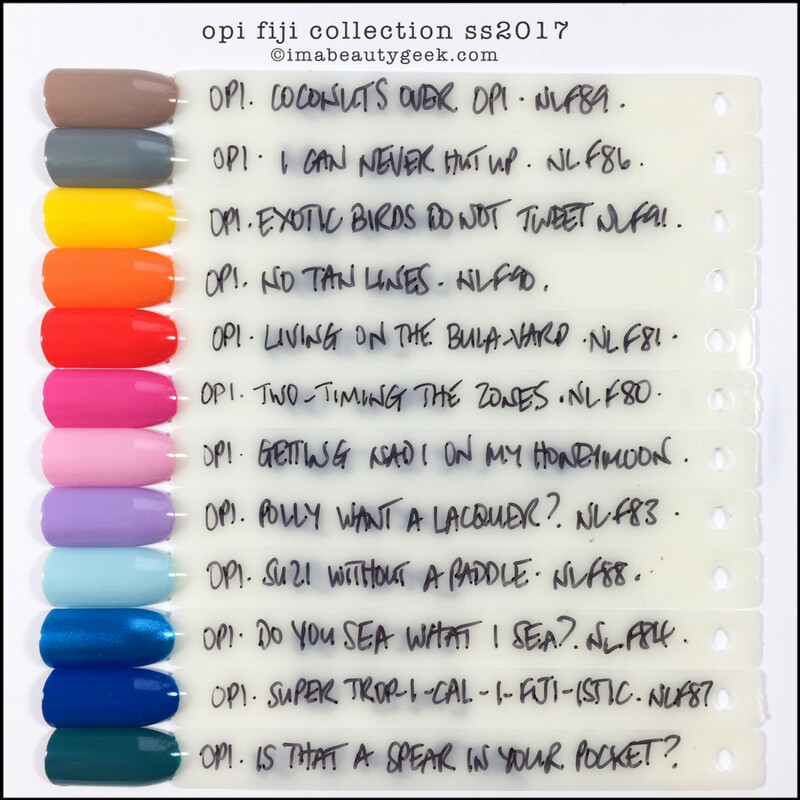 As of today, here&apos;s our post for OPI Fiji 2017 Comparison Swatches & Dupes. We hope it helps you make decisions on what you need and what you don&apos;t need! Yay! Availability: Now. 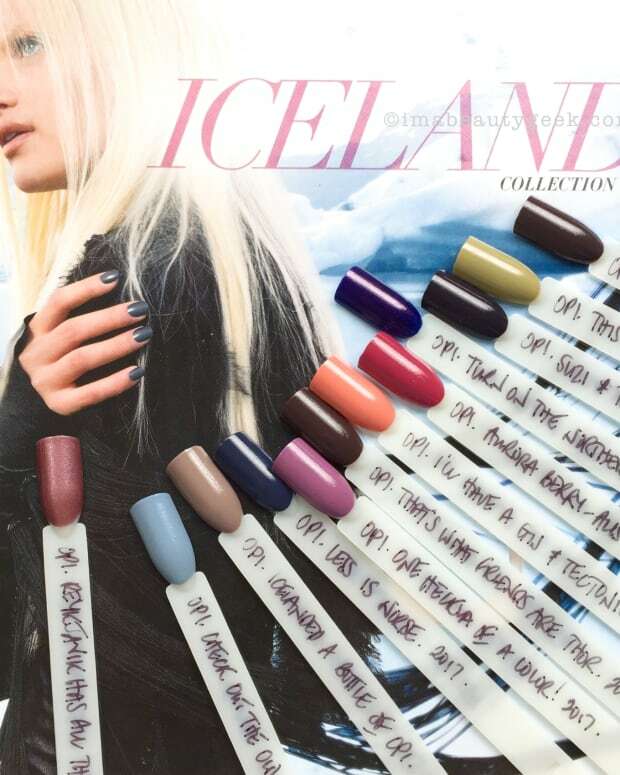 All 12 shades available in GelColor, Infinite Shine (totally go see Lisa&apos;s Fiji IS post for those! ), and this regular lacquer. Please enjoy these lazy shopping links that may or may not already have OPI Fiji for sale: sparklecanada.com (<- that&apos;s where I got mine from because they&apos;re best & fastest & a good friend to all Beautygeeks readers), amazon.ca, amazon.com, ulta.com, tradesecrets.ca. Manicures & Photographs by Karen Falcon (she’s growing her own herbs).